Pepper's Paws: I Love Stuffies!!! Yes, I know, lots of dogs love stuffies. BOL!! But I REALLY love stuffies!! I am ready to play fetch the moment I hear that squeak! I drag them all over the house. I like to sit and squeak squeak squeak. 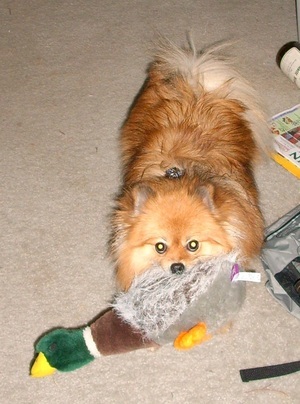 I like to play tug and keep-away with my stuffies too! All stuffies in the vicinity belong to me!! Mom like to think some of them belong to her. She has some that she puts up high where I can't reach them. Look out! The minute they hit the floor, they are MINE!!!!! I like little stuffies, medium size stuffies, big stuffies, and giant stuffies! If it squeaks and I can drag it, I want it! I like stuff-less stuffies too! even a sock with a squeaker tied inside is a fun toy to me! I have lots of stuffies! I won't let mom throw any of them away, even if I haven't touched one in months, the minute mom picks it up, I have to play with it!! They're Mine, All Mine!!! (and yes I have more and want more) BOL!!! 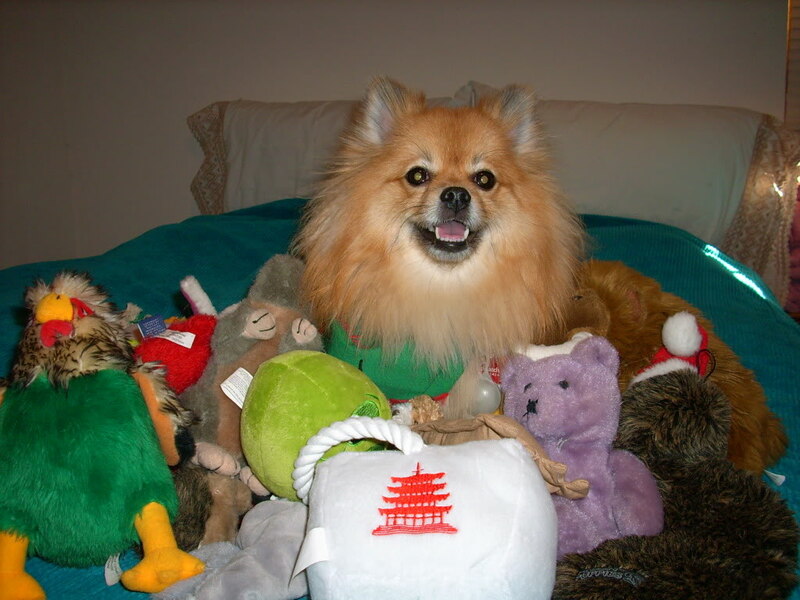 Is it possible for a dog to have too many stuffies? I don't think so! BOL!!! This is my BIG Duck! He is one of my favorite stuffies!! This is Bird (he's a chicken). Try to grab him, I dare you! Buah-ha-ha-ha!! I'm ready to play Keep-away!!! Do any of you have a favorite stuffie? Do you love all stuffies? Or do you prefer a certain size stuffie? I love stuffies, too! My favfurite is almost as big as I am. I brought it from my old home. I like squeakies, too, even though I can't hear them, BOL!!! That is wonderful you have a stuffie from your old home with you at your new home! Maybe you like the way the squeaky feels when you bite it? My pom has one toy that he plays with at a time. If we buy a duplicate of that toy he will ignore it. He did not play with any toys for almost 2 years after we got him from a rescue. Right now it is a small green dog. I hate the day it will have to be thrown away. There will be a lot of moping when that happens. I am glad he learned to play once he was with you. I hope his toy lasts a long time! I do love stuffies, but don't get them often as I usually find that they need emergency surgery and I need to open them up and pull out the infected stuffing. FYI, don't swallow the stuffing or you will get a trip to the vet to get de-stuffed which is not a fun process. Oh My!! de-stuffing at the vet doesn't sound like fun at all. I hope you fully recovered. It takes me forever to make a tiny hole, then mom sews it up before it gets big enough to get the stuffing. Thank you for sharing Oskar!